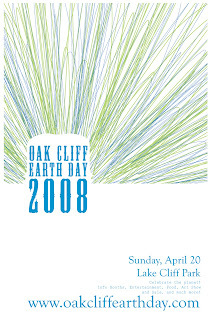 Order Your Original Oak Cliff Shirts! This is a call for artists, musicians, and volunteers! We need you! Please send me a message if you are interested in any of these positions! So, to my devoted readers (ha!)... Sorry I haven't posted in a while. Things in life have been a bit crazy lately, but I am preparing for the Oak Cliff Earth Day art show, and so, I have a lot of new projects in the works. Check back later today for some new photos!